SANTA FE, N.M. – Following a demonstration of 3,200 educational employees and allies in early October here, New Mexico teachers returned to the state Capitol, the Roundhouse, Oct. 17 in order to reinforce their demands of no education budget cuts. After a spirited picket line around the Capitol, teachers, students and friends went inside the legislative chambers to observe how their legislative representatives voted and spoke on statewide education budget cuts. Progressive legislators made valiant attempts to give voice to the teachers’ and students’ demands to close tax loopholes for out-of-state corporations. These corporations export their profits out of state in order to avoid paying taxes to the state of New Mexico. The tax proposal was defeated by a combination of Republican and conservative Democratic legislators. To legislate efforts to curtail the profits of outfits such as Wal-Mart, Target and K-mart, seemed like blasphemy against the holy order of capitalism, one participant observed. 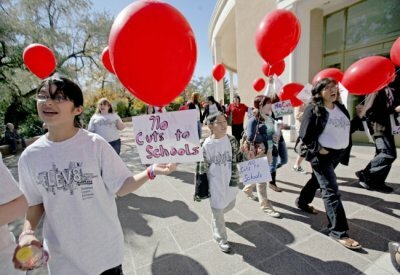 Stay tuned for further developments in the struggle for protecting public education in New Mexico. 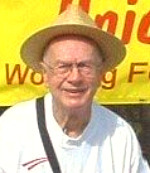 Emil Shaw was an activist on labor, social justice and retiree issues in New Mexico. He wrote many columns for the People's World and its predecessors and was a staunch supporter of this newspaper and websites. Emil died on Sept. 12, 2010, and will be sorely missed.